Need some time away from it all? Padre Island National Seashore, located just a few miles south of Corpus Christi, Texas, may be just the place for you! Established in 1965 to protect the longest stretch of undeveloped barrier island coastline in the world, the park's nearly 70 miles of beachfront are a playground for people of all ages. When venturing to South Texas, plan for hot summers and mild winters — the park is on the same latitude as central Florida. If you're planning a remote adventure, consider a four-wheel drive along the undeveloped beachfront at the seashore's southern end. In summer, you may experience a truly unique event. The park's undisturbed beach provides excellent nesting habitat for sea turtles. Stumbling upon a turtle laying her eggs is an experience few people forget! The species most frequently encountered is the Kemp's ridley sea turtle. 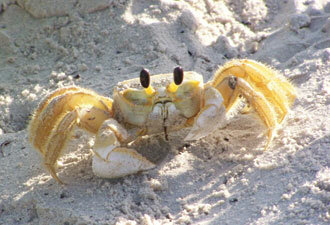 Because Kemp's ridley is the most endangered sea turtle species, the National Park Service conducts a program from April through July to locate nests and move eggs out of the reach of coyotes, raccoons, badgers, and storm tides that could destroy them. The eggs are relocated to a hatchery where they are carefully brooded for approximately 50 days until they hatch. 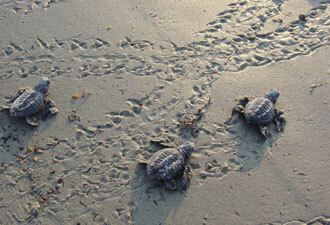 During June through early August hundreds of people come to witness the early morning hatchling releases. You can call the park's popular “Hatchling Hotline” at (361) 949-7163 for the latest details. Watching the tiny two-inch turtles swim out to sea, you can't help but wonder what the odds of survival are for such small and defenseless creatures. 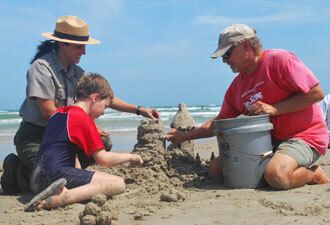 As summer passes and cooler temperatures set in, priorities change at Padre Island. Fishing improves noticeably! Many fish begin spawning and migrating in fall and early winter, which makes local favorites such as redfish and pompano easier to catch. The normally gentle seasonal winds and cooling temperatures also make this the best time of the year for camping. Fall wildflowers paint the sand dunes in a yellow hue as thousands of butterflies, dragonflies, and birds begin moving south. It's an excellent time for photography and bird watching. Not far behind the migrating birds, the park's other winter migrants arrive. Locally called “Winter Texans,” these human visitors come to enjoy the mild winter weather and to participate in free winter programs such as guided birding trips, beach walks, bike rides, campfire talks, and stargazing. Solitude and adventure are hard to find along our nation's coasts. This national seashore offers plenty of both regardless of the time of year. To experience it all, please visit the park's website or call the Malaquite Visitor Center at (361) 949-8068.